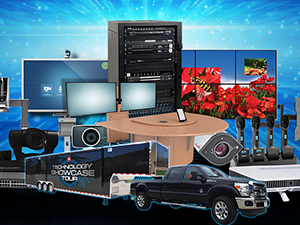 The Technology Showcase Tour, presented by BP Marketing Group, LLC., is coming to Trinity Video Communications Friday, October 10, 2014. The tour features a 36′ state-of-the-art exhibit trailer with products from nearly 20 different A/V manufacturers including Casio, Avaya, Nova, Atlona, Wolf Vision, Crimson, LG, SVSi, tvOne, Klipsch, Presentia and more. The trailer is outfitted with integrated solutions and applications for nearly every vertical. “This is a must attend event,” says John Jennings, AVP/CTO at Trinity Video Communications. “This brings together a host of high tech products you can experience firsthand, which is really cool. Whether you’re in education or the corporate sector, the Technology Showcase has something every business can use to improve collaboration and information sharing,” says Jennings. For more information about The Technology Showcase Tour, please visit www.techshowtour.com or call Trinity Video Communications at (502) 240-6100.